I've often read that some of the most creative ideas that turned into winning products were first sketched out on table napkins. The iBike Power Computer was no exception either back in 2004, according to John Hamann, CEO/engineer of Velocomp LLP - a sports technology company based in Ennis, Montana. The iBike computer is quite different from others. Affording portability and lighter weight to its user, it churns out an impressive array of readings from power, wind speed, road inclination, aerodynamic drag and even frictional losses in your bicycle's drive train by applying Newton's Third Law with the help of two inexpensive solid state sensors - an accelerometer and a wind speed sensor (also called an anemometer). 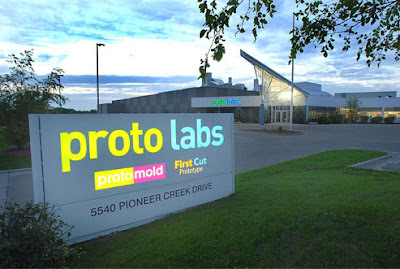 Velocomp consulted Protomold, a company specializing in automated Rapid Injection Molding for prototypes and commercial products. Plastic injection molding uses plastic in the form of resin pellets that are loaded into the hopper of an injection-molding machine. A heated barrel on the machine melts the material and a large screw forces the melt into the mold. The material cools and solidifies. The machine then opens the mold at its parting line and ejector pins push out the part. Rapid Injection Molding automates the design and manufacturing of molds based on 3D CAD models that have been uploaded online. This automation typically cuts lead times for initial parts to one-third that of conventional methods. Naturally, cost savings vary with the number of parts being produced, but rapid injection molding can have a substantial cost advantage in runs of up to thousands of parts. Protomold produces quality molds using advanced aluminum alloys and precise, high-speed CNC machining. Parts can be molded in almost any engineering grade resin, at substantial cost savings compared to conventional prototyping and production methods. If I had a choice between PT and iBike, I'd definitely pick the latter just because of the tons of features it offers. Really unmatched in the market today. I'm waiting to see what the Quark system comes up with. I think they're already begun selling Quarks. The other day I had a look at their handlebar mounted computer. Man its huge! Low cost is no alleviating factor for inaccurate power readings on the iBike. It may be inaccurate, but it is just plain ugly. It doesn't have the svelte look of a top notch cycling product. Just my opinion. Neither is the Garmin 705 or the Quark, which seems to be thin but extremely longish for something handlebar mounted. For the powerful features these systems pack, you cannot expect them to be svelte like conventional bike computers but perhaps there can be a way to do this in way of exterior body design instead of boxy shapes. Thanks Chris. The iBike shown in the article is the original model from 2006. It is now black and there is a new industrial design too, just introduced at Interbike. As for product performance, better check your facts! The iBike is in its third generation and is routinely achieving results essentially identical to products costing thousands more, on all kinds of roads. iBike showed lots of side-by-side data at Interbike that backs this claim. Is this John Hemann by any chance? I understand that ibike is in its third generation. I was just highlighting a historical story on its design. I periodically dig up old news that's interesting and put them on this website. In this case too, it was a pretty fascinating read. A majority of people who read this blog like the technical stuff. The ibike does not work accurately during acceleration spikes and decreases, and during drafting. Agreed that it may not find its place in procycling, but a lot of amateur/recreational cyclists ride alone and are interested in knowing how they're performing without worrying about incidental costs (head units, separate hub, separate wheels for everything etc). I think the iBike will find a good market with those people. Thanks. The lowest model is supposedly going to retail for only $199. Has anyone compared the data to a powertap or SRM?